在项目的 ios 目录下，用 XCode 创建一个 ios 工程，类型为静态库. 步骤: xcode -> File -> new -> Project -> Cocoa Touch Static Library. 把 native module 工程的目标静态库，引入到 RN 工程（本例中的demo工程）的链接过程中，步骤：demo Project -> targets -> demo -> Build Phases -> Link Binary with Libraries -> 添加上面创建的静态库，示例项目 中为(libPrint.a 和 libSwiftPrint.a). Important when making third party modules: Static libraries with Swift are only supported in Xcode 9 and later. 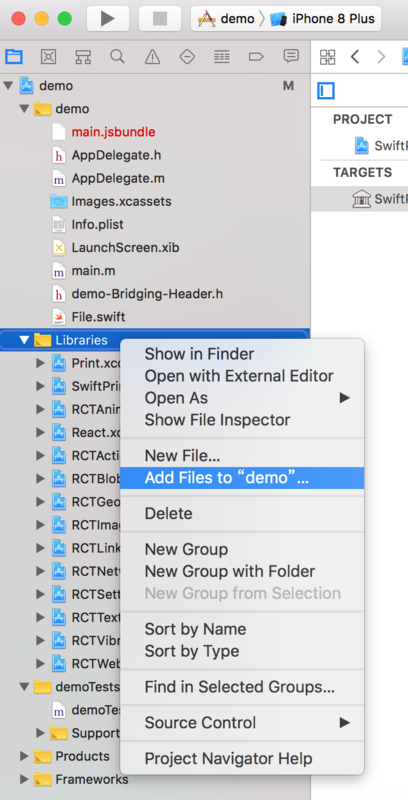 In order for the Xcode project to build when you use Swift in the iOS static library you include in the module, your main app project must contain Swift code and a bridging header itself. If your app project does not contain any Swift code, a workaround can be a single empty .swift file and an empty bridging header. 示例项目 中, 我并没有写 index.js 和 package.json. RN 插件发布后，一般都要写一段长长的说明文档，来告诉用户怎么去在 ios 和 android 项目里链接插件的原生代码。 比如react-native-navigation 的光配置部分就要3个章节：installation-ios、installation-android 和 Usage. Ios 配置一篇，android 配置一篇，js 的基本使用一篇.